The White Ranger and his White Tigerzord! Right out of the Mighty Morphin Power Rangers series. Limited edition canvas print includes artist Carlos Dattoli's signature! Measures 32-inches tall x 19-inches wide. Right out of the Mighty Morphin Power Rangers series! 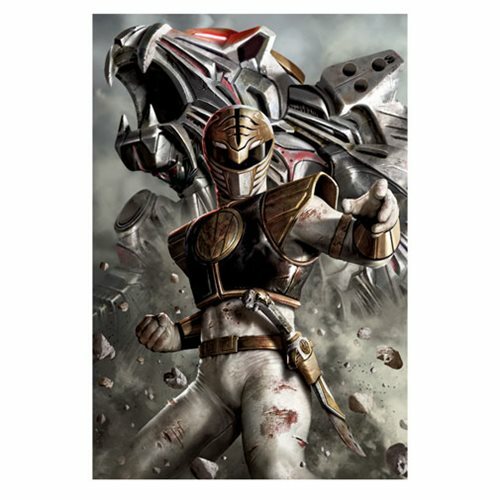 This spectacular Mighty Morphin Power Rangers White Ranger Canvas Giclee Print is a beautiful unframed piece of artwork featuring the White Ranger with his White Tigerzord standing strong in the background. Printed on canvas and complete with artist Carlos Dattoli's signature, this stunning giclee is a limited edition of just 50 hand-numbered pieces that measures 32-inches tall x 19-inches wide.